St. John the Evangelist Catholic Church was founded in September 2001, at the request of Bishop Norbert Dorsey and to be served by the Congregation of Holy Cross. 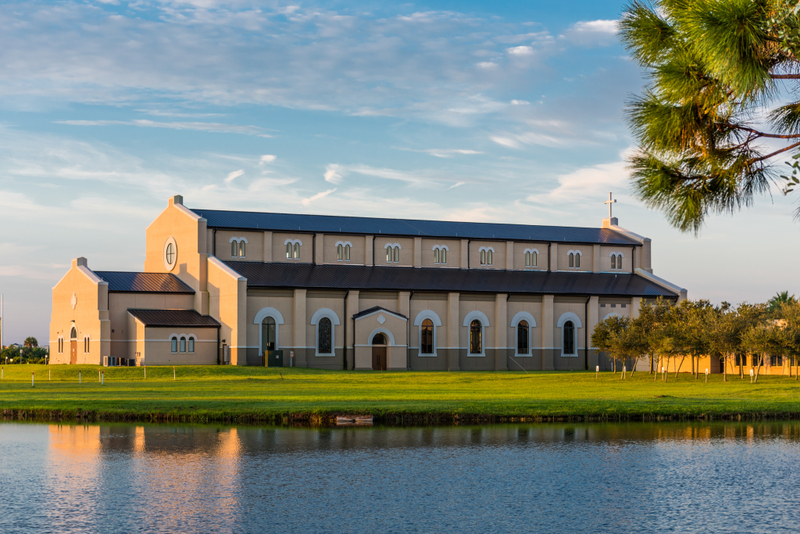 The need for this parish arose when it was announced that a new town –Viera – would be developed on a 50,000 acre parcel of farm land owned by the Joseph Duda Family. Fr. Laurence Olszewski, C.S.C. was recommended to Bishop Dorsey to be the founding pastor and Fr. Robert Wiseman, C.S.C. was assigned to be the Parochial Vicar. The parish was formed after Fr. Olszewski and Fr. 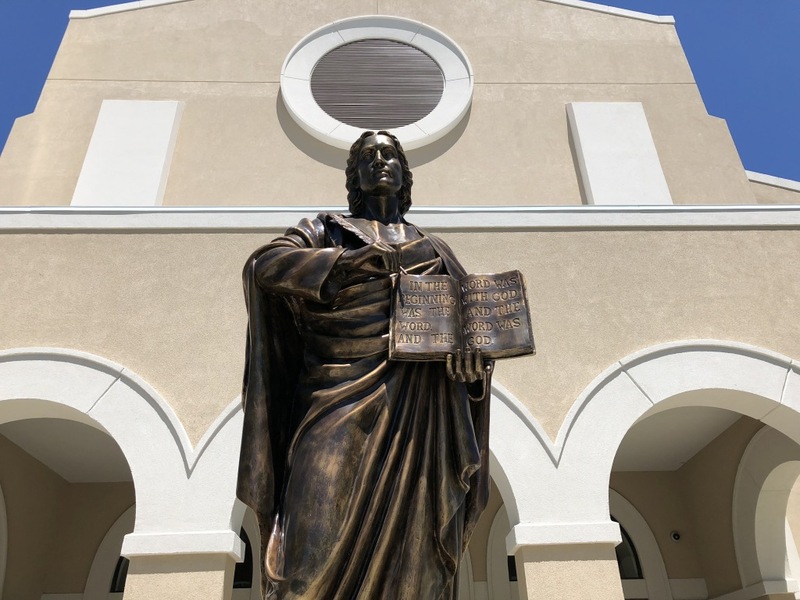 Wiseman went to both St. Mary’s Parish in Rockledge and Ascension Parish in Melbourne (our neighboring parishes) to announce the formation of St. John’s. As a result of their efforts, approximately 150 families signed up for the new parish. Initially, parishioners gathered for weekend Masses at the Brevard County Commissioners’ chambers. Daily Masses were held at Faith Viera Lutheran Church. As the parish continued to grow, a parish center was planned. Ground breaking took place in December of 2005, and the Center was completed, and occupied on Palm Sunday, March 7, 2007. The worship space in the parish center seated 750 people and a daily chapel seated 125. Included in the parish center were parish offices, 9 classrooms, and a commercial kitchen. Fr. Olszewski, C.S.C. retired at the end of July, 2008 to the Holy Cross Retirement home in Cocoa Beach, Florida. Fr. Bradley Beaupré, C.S.C. succeeded Fr. Olszewski as the second pastor from August 1, 2008 until February 1, 2018. He was assisted by Fr. Lou Manzo, C.S.C. then by Fr. Peter Walsh, C.S.C. In 2012 Fr. John Britto Antony, C.S.C. became the Parochial Vicar. Under the guidance of Fr. Brad Beaupré we were able to increase the meeting space to 12 rooms and a small gift shop. With the number of parishioners continuing to grow, Fr. Beaupré petitioned the Diocese of Orlando to begin a Capital Campaign called God’s Heart…Our Dream to raise funds to build our church. After a successful campaign and with the assurance of a loan from the Diocese of Orlando for the remaining budget we broke ground in June 26, 2016. The Church was dedicated on January 20, 2018 with a great celebration. At the end of January, 2018 Fr. Bradley retired to the Congregation of Holy Cross Retirement house in Cocoa Beach after almost 50 years of priesthood. Fr. John Britto Antony C.S.C. was appointed as the third pastor of St. John the Evangelist beginning February 1, 2018 until the present. Fr. John Patrick Riley, C.S.C. was assigned as the Parochial Vicar on July 1, 2018. St. John the Evangelist has made its mark especially for its hospitality and uplifting liturgies and multiple ministries. Though we don’t have a school at the parish as the neighboring parishes have excellent schools, we more than make up for it with our very vibrant Faith Formation Program that caters to more than 390 children from K through 12th grade. The mission to bring hope and to be educators of faith is compellingly being achieved. As for ministry to the poor our spirit of hospitality brims over to so many outreach programs that range from partnering with Habitat of Housing, to Children’s Hunger Project to Helping Hands to Giving Tree to Daily Bread and various other avenues. We continue to explore ways in which our parish reaches out to those in need. We also sponsor a Boy Scout Troop, a Cub Scout Pack, and Girl Scout group. The parish now has on record approximately 2600 families. The parish is blessed with more new registrations almost every day. The task of perfecting the newly built church continues to occupy the new pastor. The stained glass windows are being carefully and thematically conceived and executed, every one of them being taken from the Gospel of St. John, the patron of the parish. They are being custom made by Conrad Pickel Studio, INC, Vero Beach, FL. The stunningly beautiful Our Lady of Sorrows Courtyard was dedicated by Fr. John Britto Antony, C.S.C on Saturday February 2, 2019 on the feast of the Presentation of the Lord. The gracious women of our CCW have lovingly and painstakingly been taking great care of the courtyard.